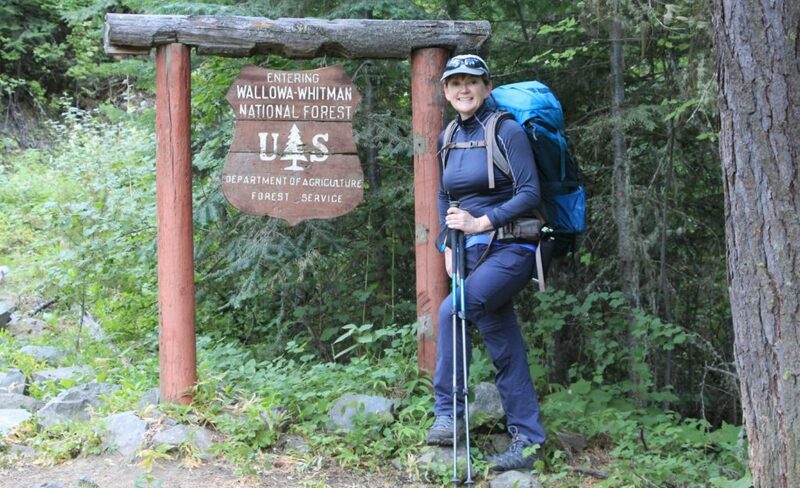 What better way to celebrate a birthday than with a four day backpack in Oregon’s Eagle Cap Wilderness? No better that I can think of! And so the first weekend of August found us doing just that. 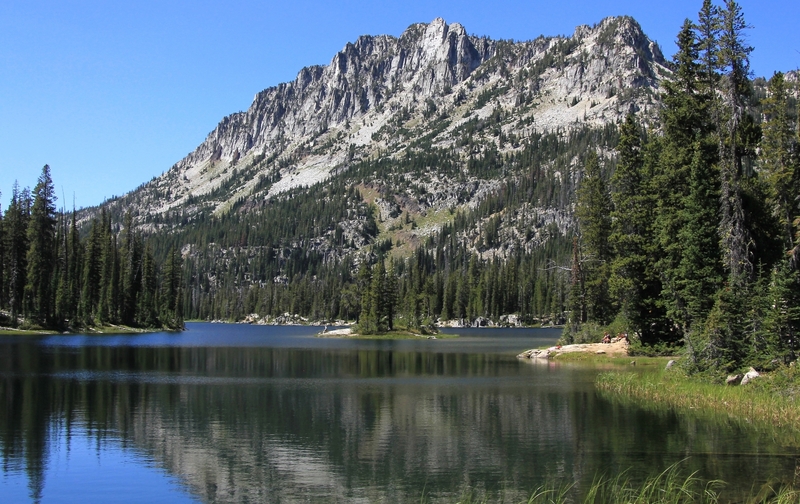 We had backpacked into the western half of Lakes Basin last summer and were eager to see what the eastern half had to offer. Wednesday night after work, we drove to Enterprise, Oregon so that we’d be close to the trailhead for an early start on Thursday. We got a room at the Wilderness Inn for the evening. The woman working the front desk was an exceptionally friendly and our reasonably priced room was simple and clean— exactly what we needed for the night. Thursday morning we left the hotel at 5:00 a.m. and drove in the dark to Wallowa Lake where we found a nice pullout just above the lake. We enjoyed a cup of coffee and breakfast while watching the dawn break. 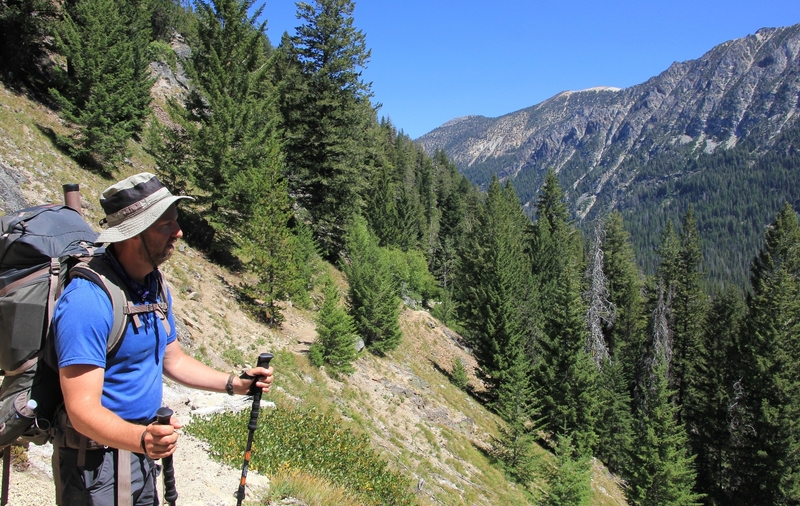 We put the finishing touches on our gear and made the short drive to the Wallowa Lake Trailhead (elevation 4,645’). After obtaining our free wilderness permit at the trail register, we hit the trail at 6:20 with a temperature of 52 degrees. A short distance from the trailhead, we reached our first trail split. 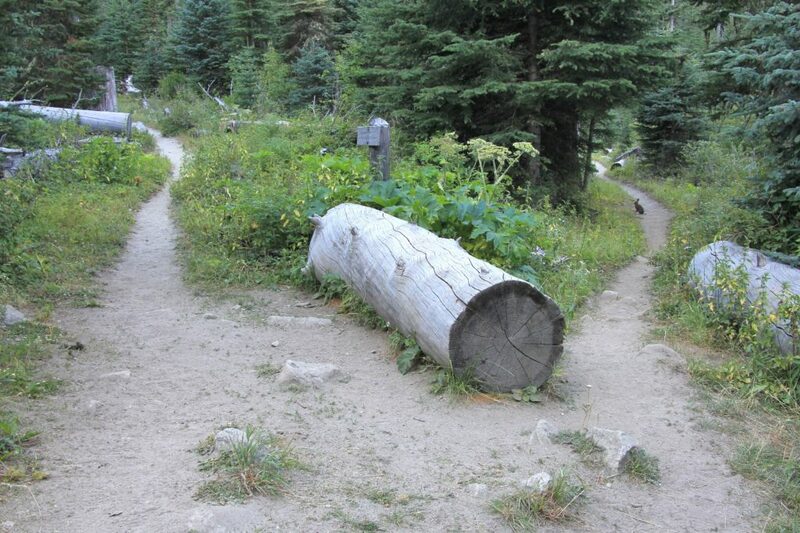 We took the trail to the right which was signed for West Fork Wallowa and Chief Joseph Trail. About a quarter mile further, we came upon another split. 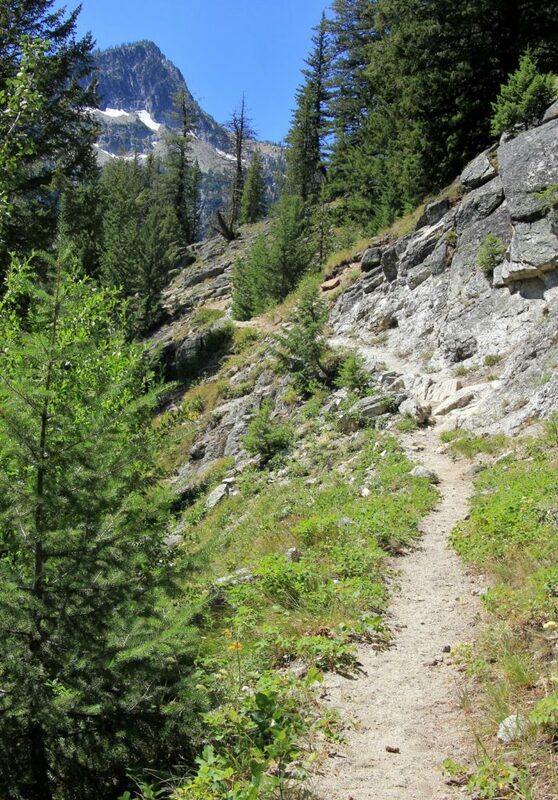 This time we took the trail to the left, #1820 West Fork Wallowa Trail. The first six miles of trail were relatively easy. We gained 1,400’ elevation, but the gain was well distributed. We’d make a short climb, then the trail would even out for a bit. It was a beautiful, sunny morning, but we were in the shade which made for cool and comfortable hiking conditions. 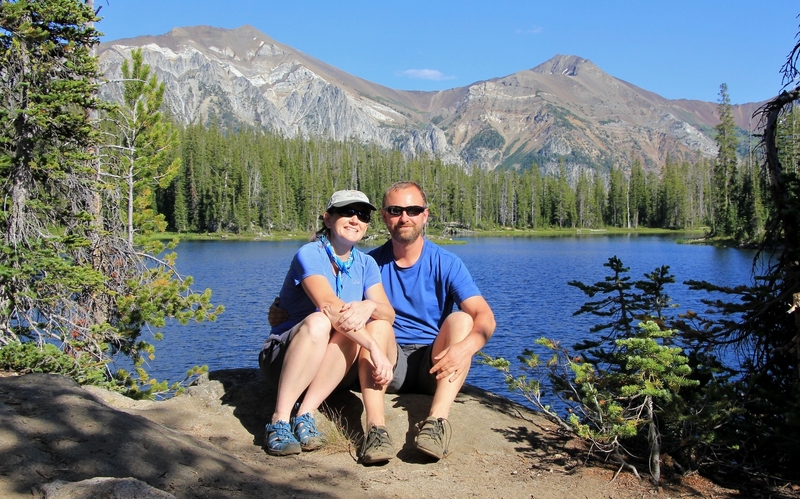 At just shy of three miles in, we arrived at the Ice Lake trail junction (elevation 5,550’) and took a nice break. Here we met our first trail company—a father and teen aged son from Joseph who were celebrating the son’s birthday with a backpack to Ice Lake. It seems we weren’t the only ones celebrating a birthday in the Eagle Cap! We continued three more miles up the trail to Six Mile Meadow. In this stretch we passed a couple groups of backpackers including a young couple with ultra-light looking gear. They were finishing the same route we were doing, only in the opposite direction. I was eager for information concerning the river crossing of West Fork Wallowa River that we’d have to make on our final day. I had read that the bridge had long since washed out and that the crossing can be treacherous. They reported that there wasn’t anything dangerous about the crossing, but that we would get wet. Their tip was to go a short distance downstream to a place that was a little wider and easier to cross. We arrived at Six Mile Meadow (elevation 6,040’) around 10:30 and took a nice long break. We had a snack and filtered some water for our climb up into Horseshoe Lake. Here we met a group of five on horseback and another couple sets of backpackers. 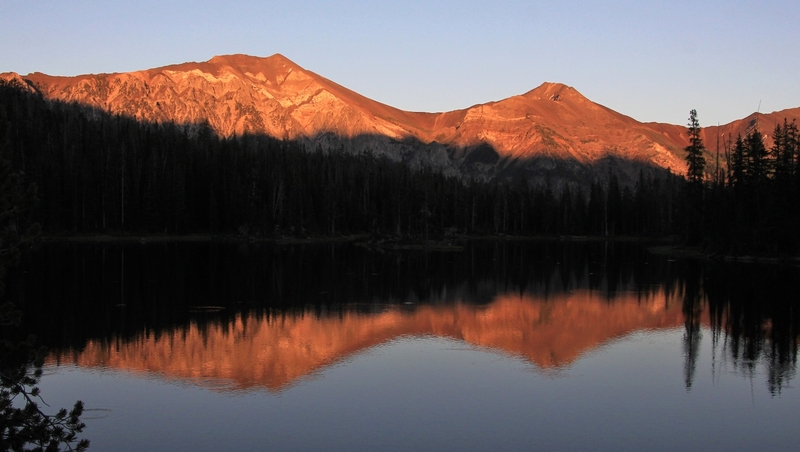 After our break, we left the West Fork trail and turned right onto trail 1810 to the Lakes Basin and Horseshoe Lake. 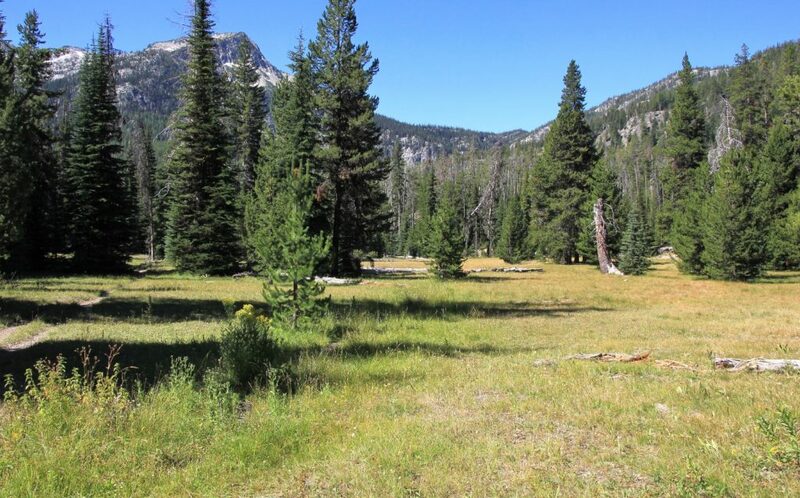 We followed along the edge of the meadows for a short distance and saw several nice (but not very private) campsites and then dropped down onto the West Fork. There was no bridge here, but we were able to stay dry by crossing on a big log jam. Here we met up with two men who looked to be father and son. They were also finishing nearly the same loop only in the opposite direction. 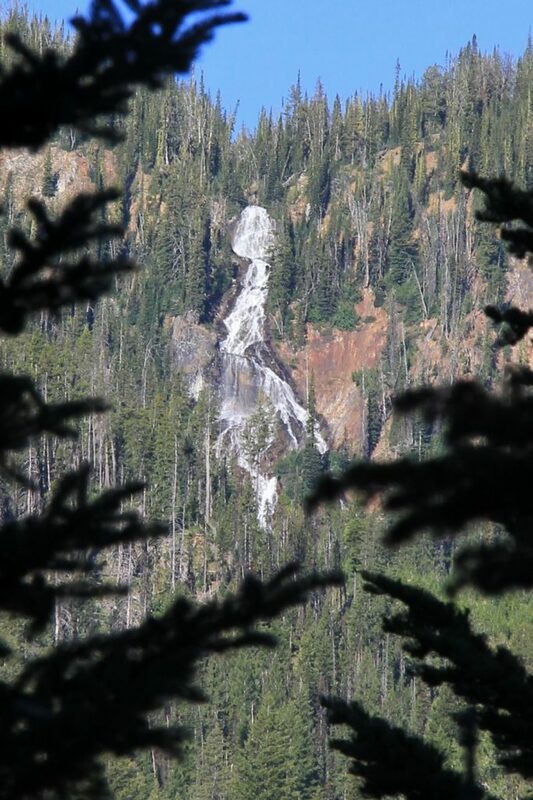 They were another good source of trail intel including a similar report on the West Fork crossing and a warning of an “overly friendly” mountain goat on the far side of Frazier Lake. A short distance later we reached Lake Creek. 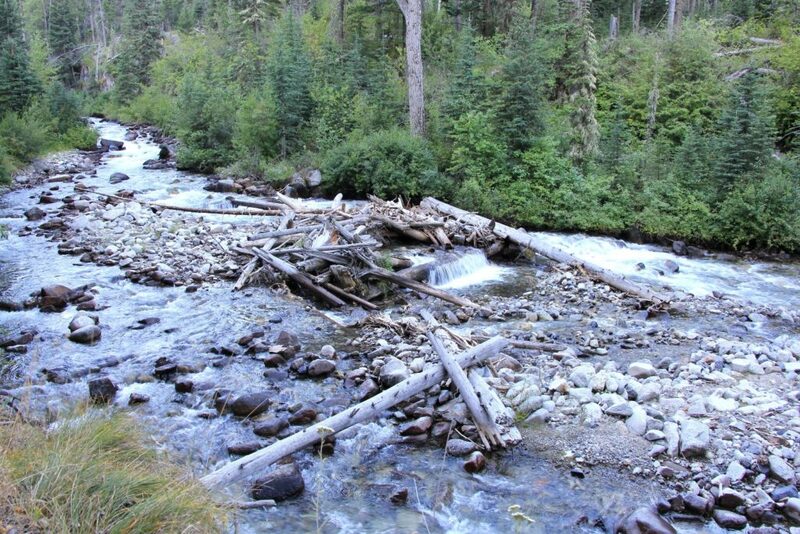 The bridge here was ripped in half and laying in ruins along the side of the creek. The water was no more than mid-calf deep, but there was no way around this one without getting wet. 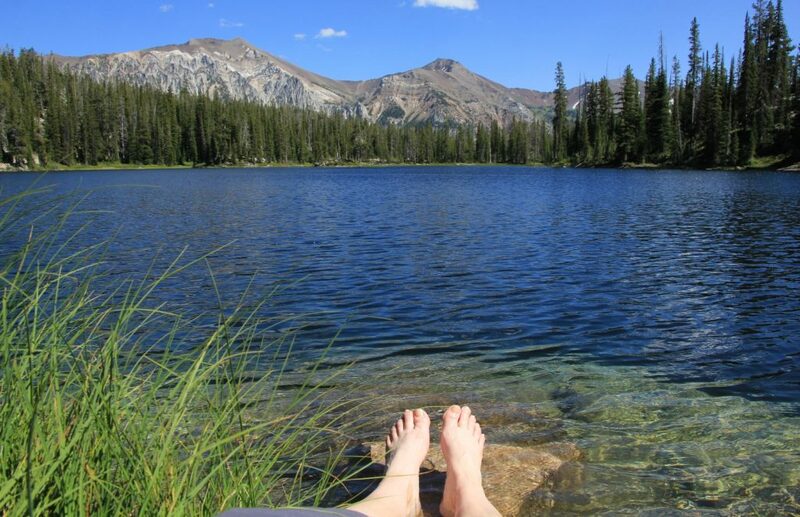 I changed into my Keens and made the easy wade across through cold water that was being fed by lingering snow melt a short distance upstream. 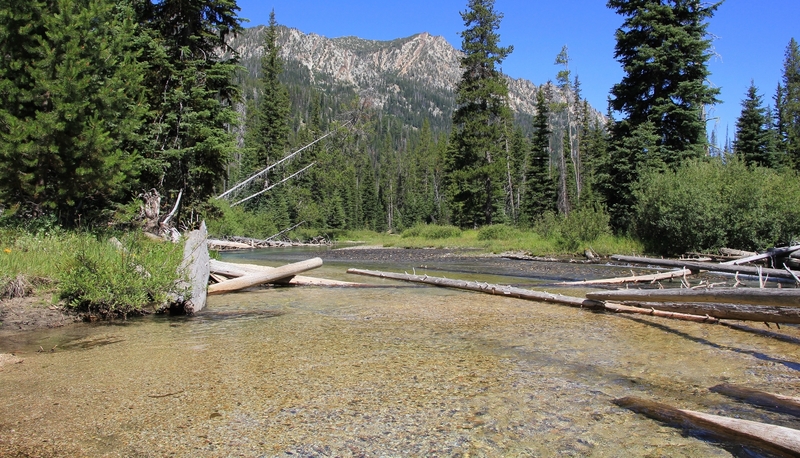 This was an exceptionally scenic spot on the trail with beautiful water and stunning mountain peaks in the distance. 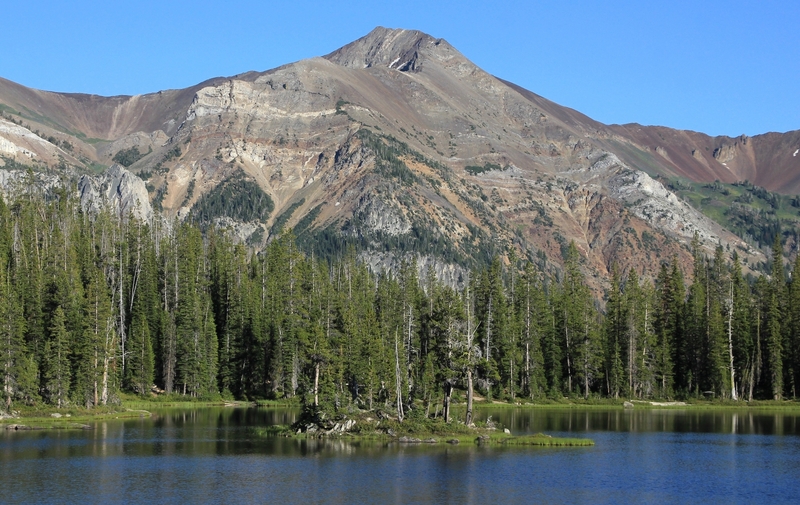 From the crossing of Lake Creek, we began an approximately 2.5 mile climb with 1,000’ gain to Horseshoe Lake. By now it was about noon and much of the trail was in the sun on the exposed side of the canyon. I was delighted to find more shade than I expected, but it was still a warm slog up the hill. The lower half of the trail had some nice views back to Six Mile Meadow and up canyon where we’d be returning on Sunday. 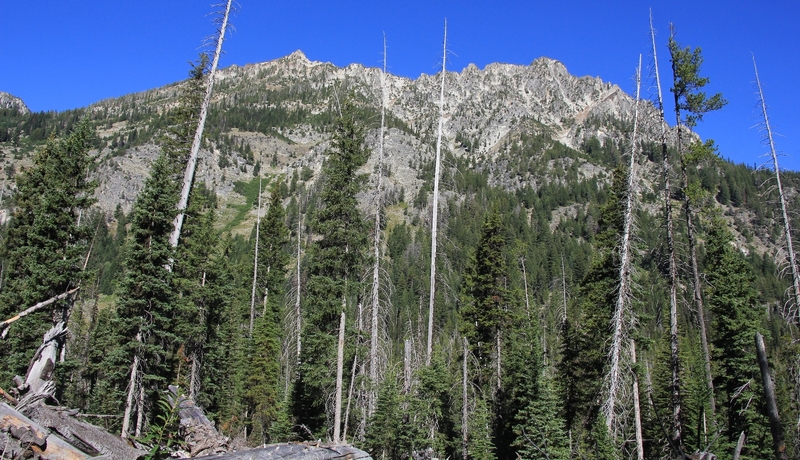 At about 1:40 we topped out and were standing near the outlet stream for Horseshoe Lake, elevation 7,135’. It was a stunning lake of good size with a cute little island not far from shore. There were people in the first couple sites we saw, so we continued up toward the head of the lake. Near the far end of the lake, we found a lovely spot above the lake with a spectacular view. There was a nice place to get water and swim just below camp. This would be a good place to wake up on my birthday. The view from our camp was of towering peaks off to the east. 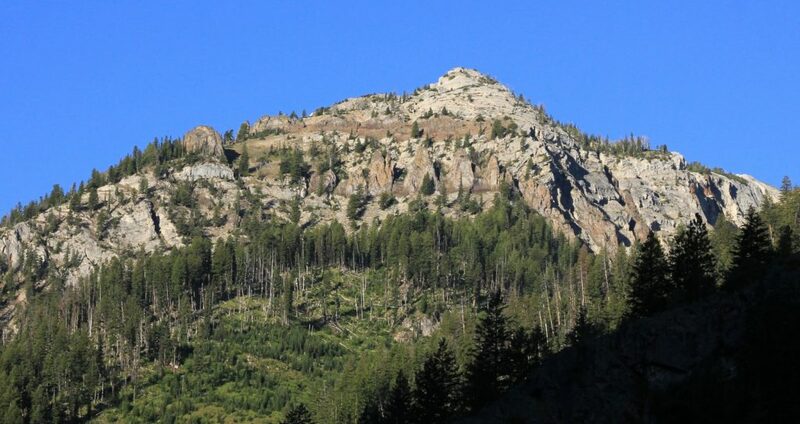 There was a set of three predominate peaks along a long ridgeline. The one to the far right was dark brown and looked like it must have been Aneroid Mountain. 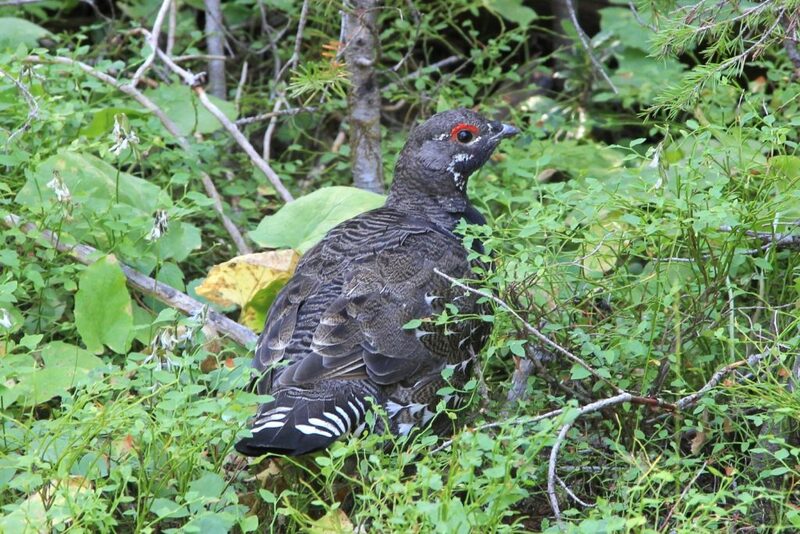 If so, we would have been looking at the opposite side while on our Bonny Lakes backpack a month earlier. 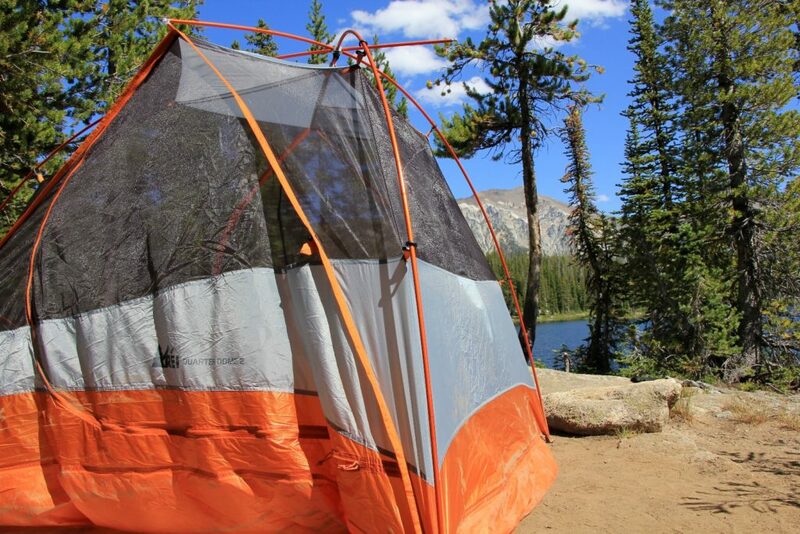 We spent a lovely afternoon around camp with sunny skies and temperatures in the upper 60s. Jason took a nap and then went for a swim in the cold lake while I spent most of the afternoon reading. For dinner we had a dehydrated chicken and rice Mountain House meal with a side of couscous. After, we took a short walk up the trail to check things out. Our company for the evening was a doe who grazed near our campsite. 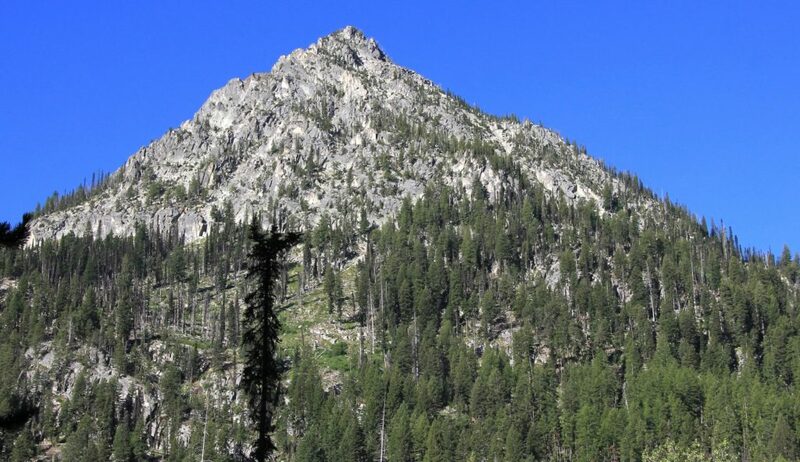 Our mileage for the day came in at 9.5 miles to Horseshoe Lake with 2,500’ elevation gain and about another half mile exploring the immediate area around camp. To continue the story, please see our posts for days two, three, and four! 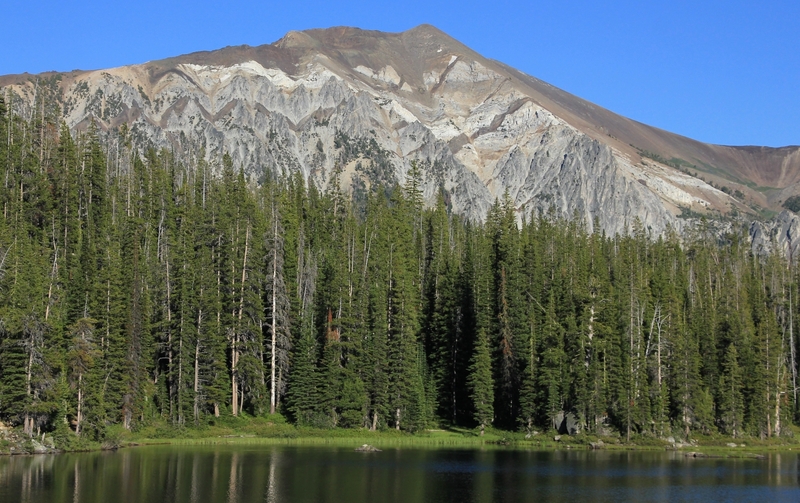 Directions to Wallowa Lake Trailhead: From Joseph, Oregon, follow signs to Wallowa Lake. 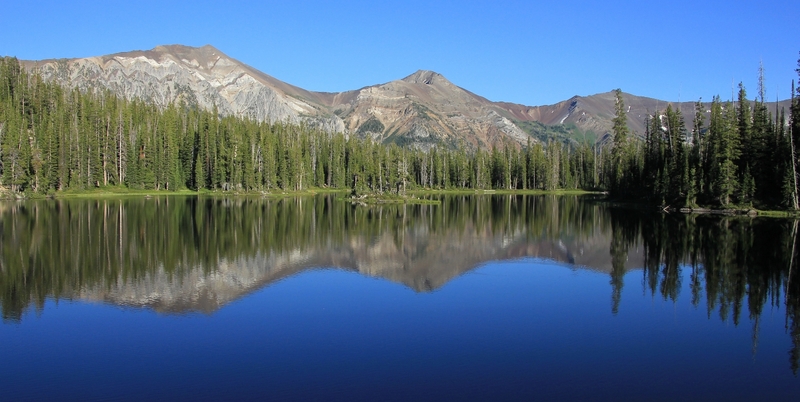 At the far end of the lake (near milepost 6), the road will bend to the right toward Wallowa Lake State Park. 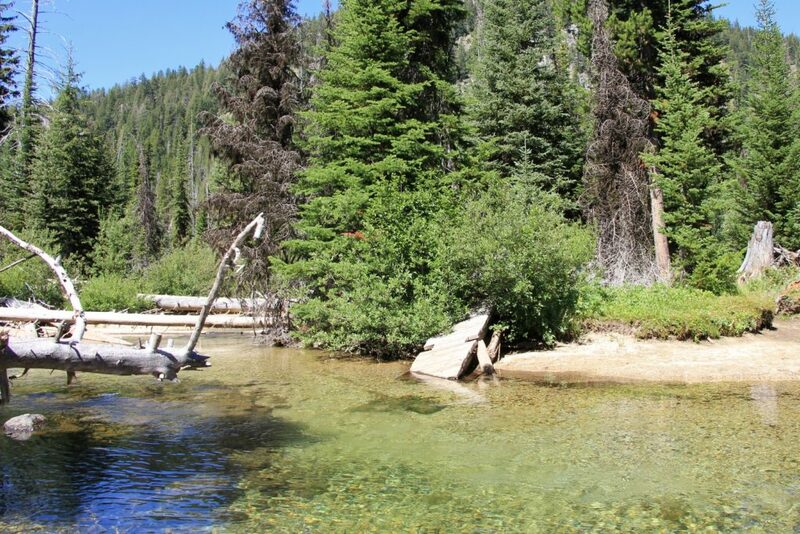 Take a gentle left turn here and drive approximately one mile to the end of the road and the signed Wallowa Lake Trailhead. The parking area is huge, but very busy. We saw many vehicles parked in no parking areas and cars parked in clearly signed horse trailer zones. 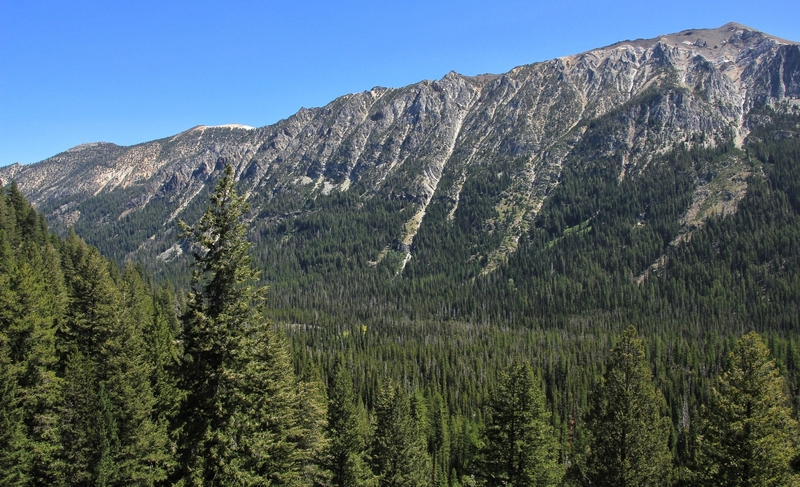 Unlike many trailheads in the area, the Wallowa Lake TH does not require a Northwest Forest Pass. Nicely done ! Great photos and I love this part of Oregon . It has such great views and high lakes to enjoy as you so nicely have shown .